Residents of New Hampshire have opportunities to experience both city and small-town life, as they enjoy both the state’s natural beauty as well as its proximity to several major Northeastern cities. With no income or sales tax, the state also has one of the lowest tax burdens, as well as one of the lowest crime rates in the nation. New Hampshire is a highly desirable place to live and work. Teachers in New Hampshire enjoy advantages relative to their occupation as well. They earn competitive salaries, enjoy low student-to-teacher ratios, and reap the benefits of the state’s award-winning initiatives in educational program development. New Hampshire’s opportunities can become your opportunities. What are some of the benefits of becoming a teacher in New Hampshire? New Hampshire is committed to providing the highest quality education for its students, and has been a leader in developing progressive new programs to improve individualized learning plans for its students. The New Hampshire State Board of Education, and Department of Education, was presented the 2012 Frank Newman Award for State Innovation in recognition of their successful and innovative competency-based learning programs for K-12 students. One of those programs is Follow the Child, developed as an extension of the federal No Child Left Behind Act; this initiative facilitates student achievement through flexible individualized learning designed at the local school level. At the high-school level, students work with teachers to develop individualized learning plans, which in turn allows them to learn at the pace and style that suits them best. Follow the Child has become a model for individualizing student education in states throughout the nation. New Hampshire has actively supported many other initiatives to improve the quality of public education in the state. Another successful program, Career Pathways, has been developed in partnership with industries and postsecondary institutions in the state. Sixteen different “career clusters” have been developed, helping high-school students explore potential careers by providing them with expert consultants, expanded career information, and career planning outlines. New Hampshire boasts the highest secondary-school graduation rate in the nation, and a high-school dropout rate of only one percent. In addition, its eighth graders have consistently scored among the top states in the nation on the National Assessment of Educational Progress (NAEP) science exams. More information on the educational climate and current program initiatives are available on the New Hampshire Department of Education website, as well as on Governor John Lynch’s website. The National Center for Education Statistics predicts a 22.8 percent increase for all jobs in education and library-related fields in the state of New Hampshire through 2018. Although student enrollment is predicted to decrease slightly (less than five percent) through 2019, an increase in the number of retiring teachers is expected to result in a steady need for new teachers. Teachers in rural areas and with specialized skills and education are in high demand in New Hampshire. In addition, the U.S. Department of Education has identified some of the states’ greatest need for teachers through 2013 in the following areas: English for Speakers of Other Languages, mathematics, science, reading and writing, special education, technology education, and world languages. 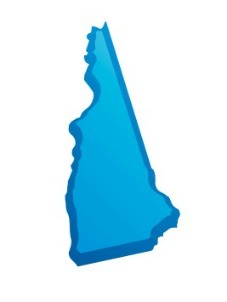 Where can I work in New Hampshire? There are 166 school districts in 10 counties in the state of New Hampshire, offering a variety of teaching opportunities in both urban and rural school settings. Manchester is the largest city and school district in the state, with 22 schools, 1,046 teachers and 14,899 students. Representative of some of the more rural districts in the state is Monroe, with 1 school (K-8), 9 teachers and 117 students. A complete listing of schools in New Hampshire, as well as comparison charts and information on specific schools, can be found at the New Hampshire Department of Education website. New Hampshire offers teachers competitive salaries, has one of the lowest student- teacher ratios in the country (13.7 students per teacher), and is active in local and national educational initiatives. Most school districts in the state provide comprehensive health-care plans, as well as dental and other benefits. New Hampshire has an active teacher association, the National Education Association–New Hampshire (NEA-NH), that supports and advocates for educators’ professional, political and financial needs. The organization keeps members informed of professional development opportunities, legislative issues related to education, hosts professional issues conferences each year, and offers members discounts on insurance and other products and services. Teachers enrolled in the New Hampshire Retirement System (NHRS) can retire at the age of 60 regardless of the number of years of service. Those with 10 years of creditable service can retire anytime between the ages of 50 and 59; and members with 20 or more years can retire before age 50 if their age plus years of service add up to 70 or more (e.g., 48 + 22 years of service = 70). The NHRS offers a comprehensive retirement plan and planning service to assist teachers in preparing for their futures. How do I become a teacher in New Hampshire? New Hampshire offers two traditional and three non-traditional options to become certified to teach in the state. The traditional routes require graduation from an approved in-state or out-of-state teacher preparation program. The alternative routes to certification require the completion of education or experience in the specific area they wish to teach. For more information on teacher certification in New Hampshire, in addition to links and advice regarding documents, the process, and contact information, visit teaching-certification.com.